Well, here it is, page 600. Not even a key story point. X] When I wrote this out, however long ago it was, this part would have ended 10 pages from now. Taking approximately the same amount of pages as the first part. Since then I changed the ending and several other parts. This section still draws to a close before long, but not when, or how, I originally planned. In some ways this was meant to be Reggie’s story. No one character dominates it particularly, but his actions cause the friction that spurs change in everyone else, and, in a small way, himself. In a story like this there isn’t a clear villain. Reggie is the most misguided, but no one cast member is perfect. Still, he’s as close as it gets. Thomas is shifty and manipulative. Ed is full of short guy rage. Jolene is alternately manic and timid. Carol is bossy, flirty, and mean. Mike is weak willed and unfair. John is detached. Which leaves Nina. I’m sure she has some negative traits too. She’s openly snotty to Reggie, which makes sense in light of their implied past though. I suspect Nina subconsciously enjoys Reggie’s attentions. However she got away pretty clean compared to everyone else. But that’s as may be. The point is that none of them are angels. I certainly understand the ire Reggie evokes in people, but if you look at the big picture he’s a minor evil. And that’s as it should be. He fills his archetypal role just like they all do. Huh. 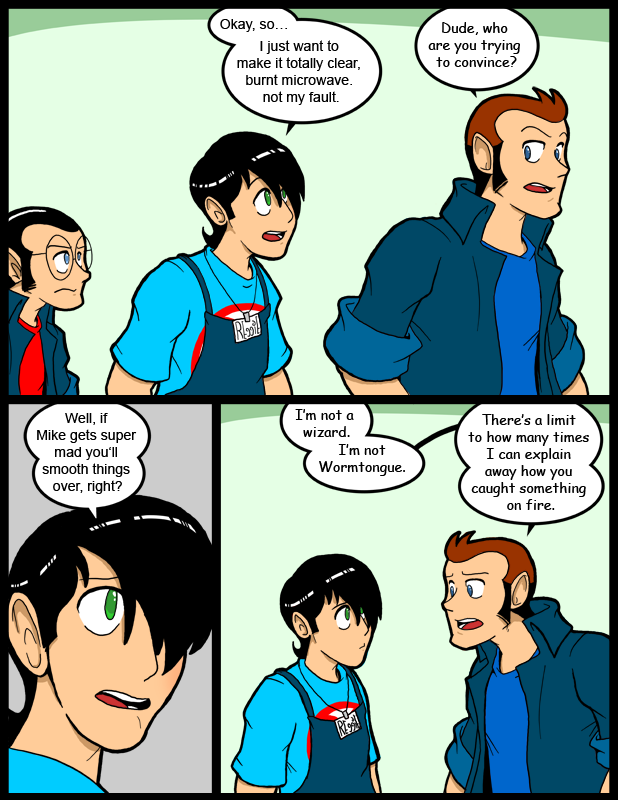 Reggie looks kinda cute in the last panel. Guess if he lost a bunch of the arrogance, might not be so bad. I enjoy Reggie’s fears for the consequences of his actions. Be a man, you little Wuss! Take responsibility for your actions. And don’t forget; METAL DOESN’T GO IN MICROWAVES! Hey, did everyone lose their number ears? I love that in the unwritten backstory, Reggie has caught so much on fire that they have run out of excuses to explain it. Storm crow descending, winter unending. Storm crow departing, summer is starting.